Maybe once a year, I get hit with the flu/cold/whatever it is, and it hammers me for a day or so. This was the week, and the flu-cold shut me down on Tuesday. Other than that, I made it to work every day. Unfortunately, some of the ill side-effects are a bit slower to depart, and I didn't feel up to any epic travels this weekend. So this morning, I hit a few local hotspots with certain targets in mind. Two of which follow. It appears that one of the local Great Horned Owl pairs has commenced the business of making owlets. 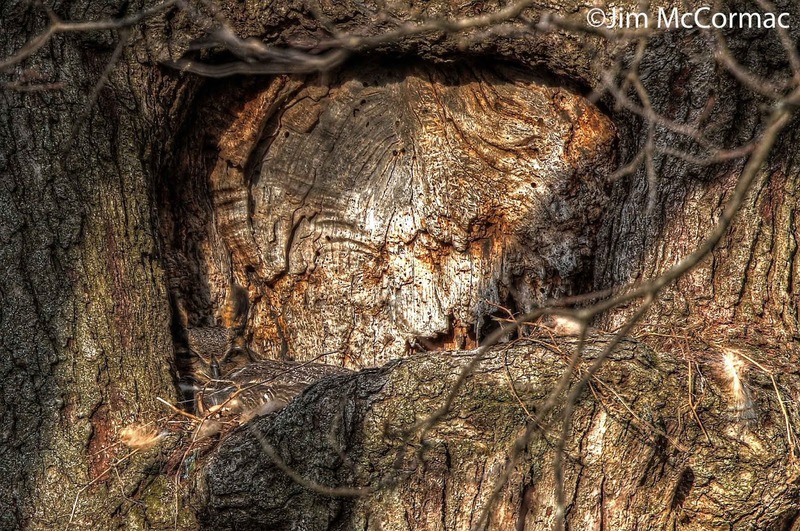 This cavity in a massive white oak is a site used a number of times in past years by the owls. As she's been nestled into this same spot for over a week now, she must be on eggs. A typical clutch is two eggs, and the female owl does all of the incubation. The male earns his keep by bringing regular meals to her. 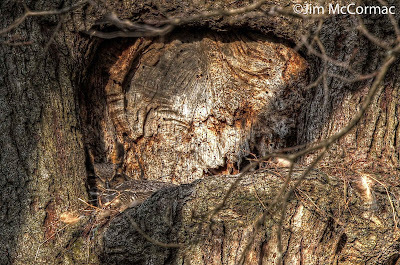 Late January is right on schedule for nesting Great Horned Owls in central Ohio. The female owl's extraordinary feathering allow her to maintain an incubation temperature of about 98 degrees even when the ambient air temperature plummets to minus 20 or colder. Such early breeding syncs the arrival of the baby owlets with the peak spring activity of striped skunks. Great Horned Owls are one of few predators that regularly make meals of skunks, and this striped delicacy is an entrée regularly served to many an owlet. An utterly fearless Merlin glares at the cameraman. There was another nearby, occupying Union Cemetery in Columbus. They've been present all winter, and are remarkably tame even by urban Merlin standards. Nonetheless, I would not advise getting TOO close. One hundred or so feet away is plenty near for outstanding views, and the bird or birds will probably not even bother to register your existence at that range. Lest you wonder how I could get such a frame-filling image from afar, I was using a telephoto rig with the equivalent to about a 1120mm focal length. The Merlin stretches his appendages during a bout of preening. I noticed that his right foot and leg were still bloody. These small falcons are bird specialists, and I suspect the blood issued from a hapless songbird of some sort - maybe a starling if luck is with us. I'm trying to force myself to be somewhat mellow until this flu-thing fades completely, so after about an hour with the Merlins, I headed for home. I'll hope to get back for some more, though. They're great fun to watch, because sooner or later, the hunger pangs will strike and the falcon will go on the hunt. Few things are as remarkable as the spectacle of one of these feathered bullets turning on the juice, flying down some luckless bird, and pulverizing it. 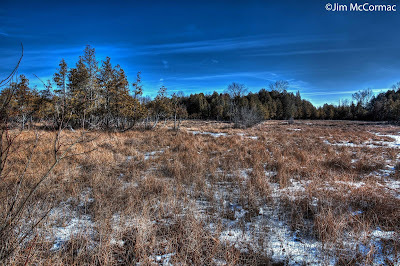 The meadows of Cedar Bog in a state of temporary dormancy, as seen last Sunday. I stopped by here on my way to Dayton and Aullwood Audubon Center, where I was slated to give a talk. While the vast majority of my many dozens of trips to Cedar Bog have been in warmer seasons, I like to occasionally stop by in the dead of winter. It gives one a broader sense of perspective to see these sites in all seasons. Come spring, Cedar Bog will burst to life in an explosion of flora and fauna. It is a must-see natural area. 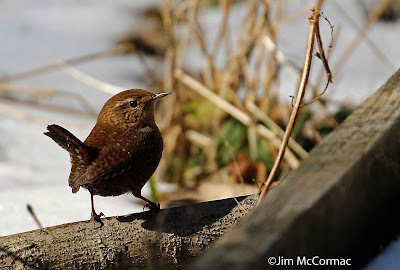 At one point, this tiny Winter Wren popped out from under the boardwalk to regard me with bright curious eyes. He was no doubt hunting spiders and other such succulent fare in the sub-boardwalk's gloom. 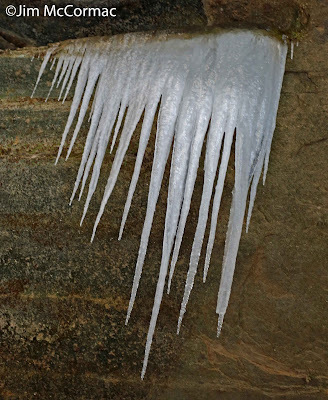 As if to help cast off fears that winter will never end, he flitted to a nearby root tangle and burst into song. The voice of a Winter Wren must be heard to be believed: a stunningly complex gushing aria that puts nearly all other North American birds to shame. 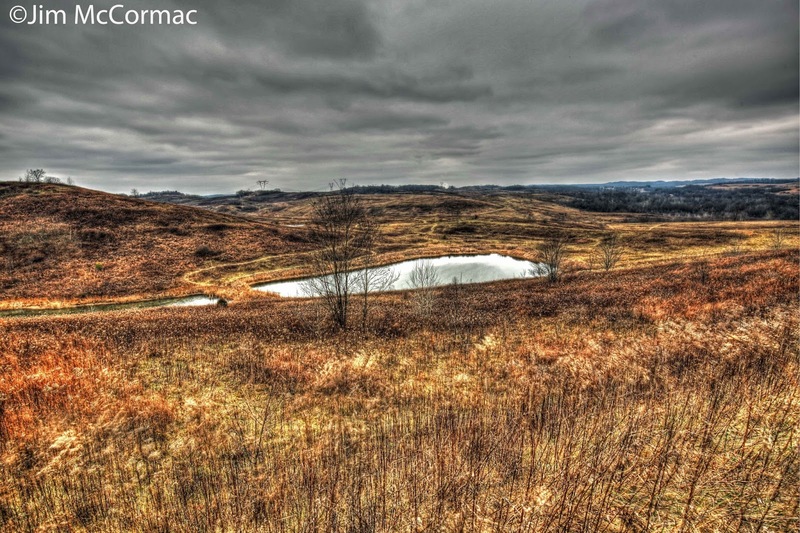 Photo Workshop - March 12th or 13th - Goose Pond! I am pleased to be working with photographer extraordinaire David FitzSimmons and Roberts Camera in Carmel, Indiana, for two one-day photo workshops. More on them HERE. 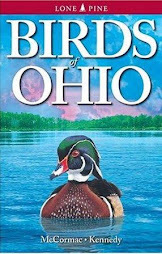 Our venue is the amazing Goose Pond near Linton, Indiana, a place that has already taken on legendary status in the birding world. Read about Goose Pond HERE. Dave and I will each give an indoor lecture about various facets of photography, but the majority of the time will be spent afield. As Goose Pond should be teeming with birds in mid-March, that's what we'll mostly focus on. But there will certainly be time to dabble in other subjects such as showy landscapes, HDR techniques, and even macro photography. A trio of Redheads coasts in for a landing. We'll really focus on bird photography tactics, including getting sharp in-flight shots. 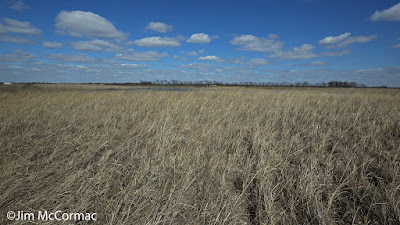 There should be lots of meaty subjects about, including many species of ducks, and thousands of Sandhill Cranes. March is the month that spring really bursts to life. 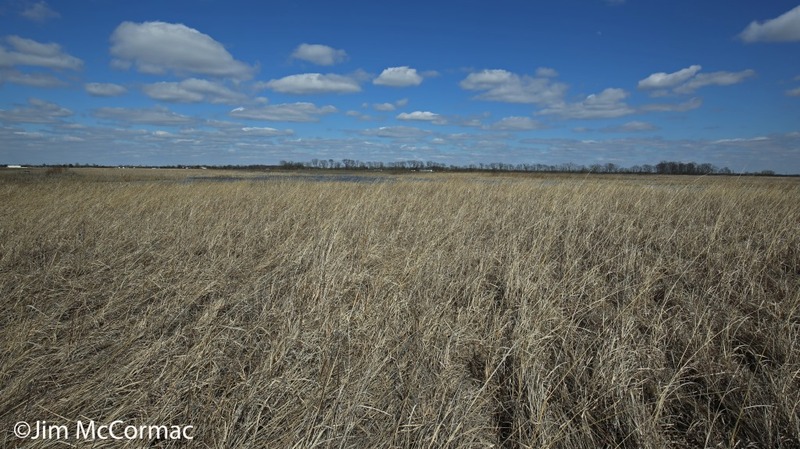 Red-winged Blackbirds will be gurgling away and the marshes should be ringing with the calls of Spring Peepers and Western Chorus Frogs. We'll do our best to see - and photograph - all of it. And learn lots of tips and tricks in the process. 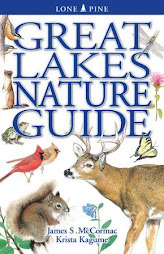 Not to mention see lots of birds, and learn more about our feathered subjects and their identification. We welcome all levels of photographers, especially beginners to intermediates. If you're interested in attending, just CLICK HERE for more information and registration details. I hate to break it to you, arachnophobes, but spiders are everywhere, even when snow flies and the air is super-chilled. The ones in your house (and there are many) have it easy. Not so with the spiders that remain feral and outdoors, where most people wish they would stay. Huge numbers of spiders spend winter in leaf litter, in tree bark, and on twigs and branches. On wintry days when the temperatures rise above freezing, some become active and go on the hunt. 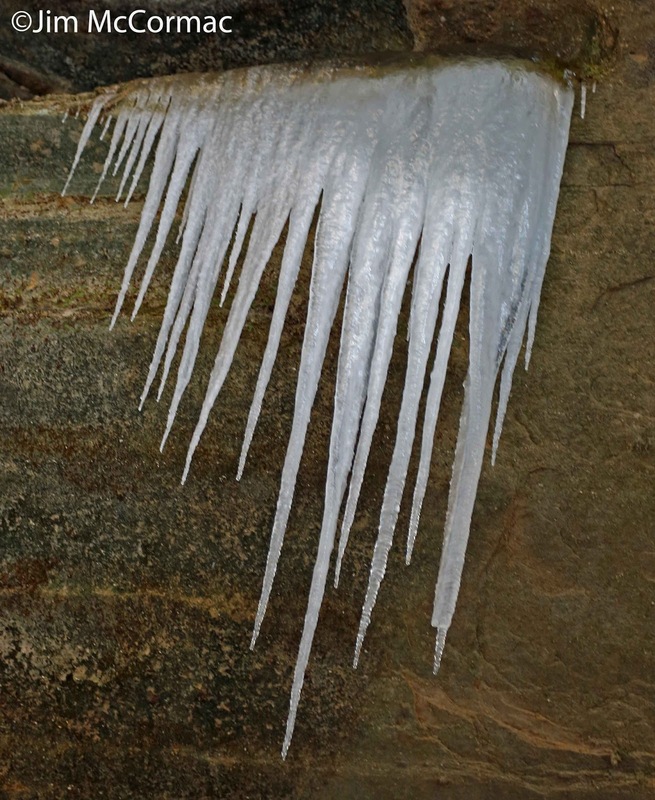 Dec. 12 was relatively balmy, with afternoon temperatures reaching almost 50 degrees. I met naturalists David and Laura Hughes at Clear Creek Metro Park on the north edge of the Hocking Hills for photography and exploration. 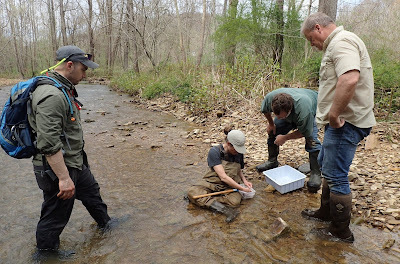 Clear Creek is a biological hot spot and always produces interesting sightings. We hadn’t gone far down a trail when Laura spotted a tiny web, over which an even tinier spider stood vigil. She had found the amazing triangle spider (Hyptiotes cavatus). 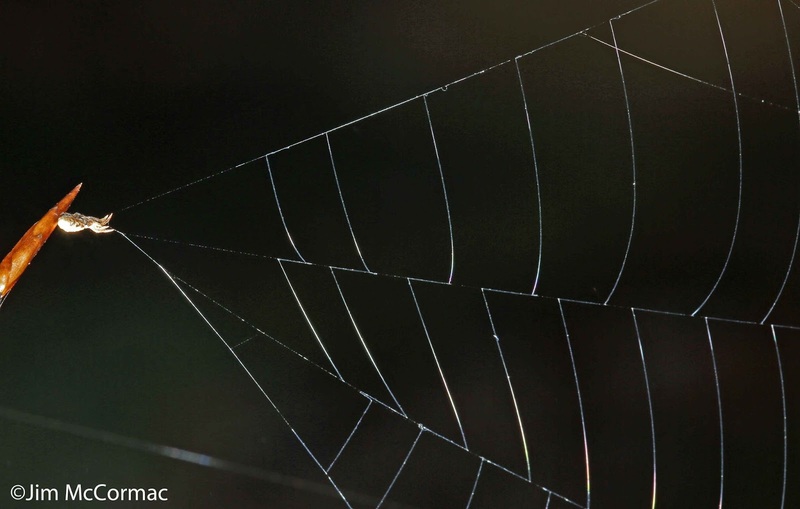 The triangle spider constructs a perfect vertical wedge of a web; sort of a silken pie slice of doom. This web is far easier to spot than the 3-millimeter spider that tends the trap. As the spider completes the web’s construction, it ratchets the small end taut via an anchor line. It pulls this line ever tighter, until the spider is holding the web under great tension, like an archer who has drawn a bowstring to full tautness. When prey — usually a tiny insect — hits the web, the spider releases the anchor line. The web goes slack and engulfs the victim in a sheet of silk. Sometimes the spider gives the web a few hard jerks to further ensure that the prey is entangled. The triangle spider belongs to the Uloboridae family, which is mostly tropical — only 16 species occur north of Mexico. While most spiders produce sticky silk, these spiders create nonsticky silk via a specialized organ called the cribellum. Such silk is soft and puffy, and when employed as a quick-release snare is quite effective at snagging victims. Another noteworthy oddity of Uloboridean spiders is that they are nonvenomous. All other North American spiders possess potent venom. When a victim is snared, the triangle spider rushes out and deftly enshrouds it with dense wrappings of silk, like a mummy embalmed by an overzealous undertaker. After consuming its meal, the little spider fastidiously reorganizes its web, tightens the drawstring and awaits another victim. 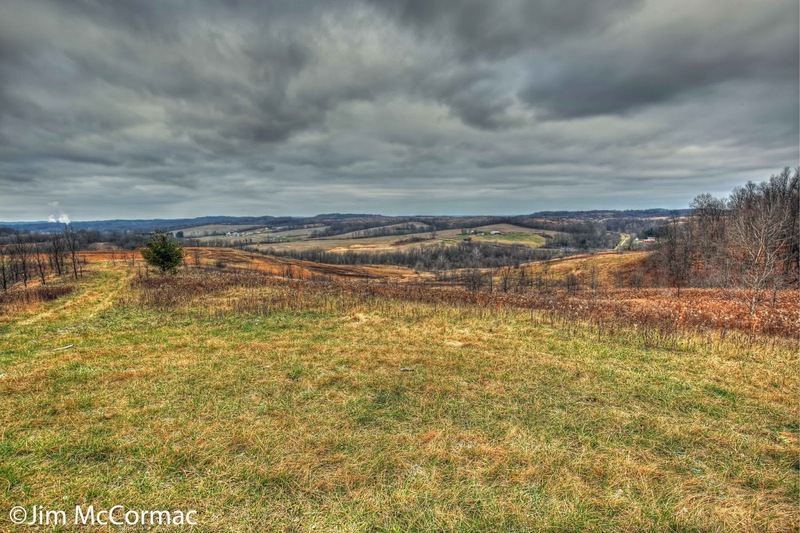 Naturalist Jim McCormac writes a column for The Dispatch on the first, third and fifth Sundays of the month. 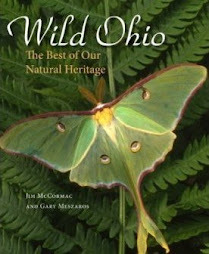 He also writes about nature at www.jim mccormac.blogspot.com. We had a decent amount of rain towards the end of last week, and I figured that water flow in our creeks and streams would be just about right last Saturday. 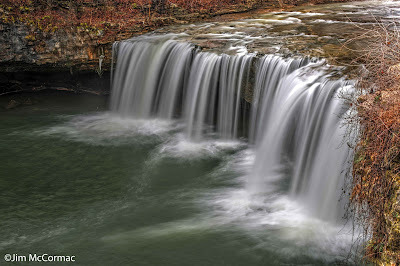 I had long been wanting to shoot images of some waterfalls in west-central Ohio, but for optimal imagery the water volume should not be too little, nor too much. And is it turned out, three of the four falls were just about spot on. The fourth, Charleston Falls, did not have as much water as I would have liked for some reason, but nonetheless the rock formation looked stunning. 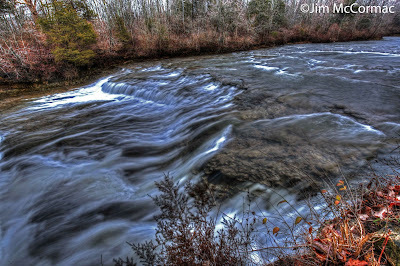 Although circumstances do not allow it, I would love to go re-shoot these falls tomorrow morning. Since the relative balminess of last weekend, when I made the following images, temperatures have nosedived. It is about 7 F as I write this. These waterfalls should be spectacular ice sculptures by now, and will have taken on an entirely new look. All of these waterfalls are in Miami County, and details about each, including location, can be found by consulting The Google. The West Milton Cascades. This hidden gem is tucked away smack in the middle of the little village of West Milton. One would be hard pressed to find a more scenic falls in Ohio. 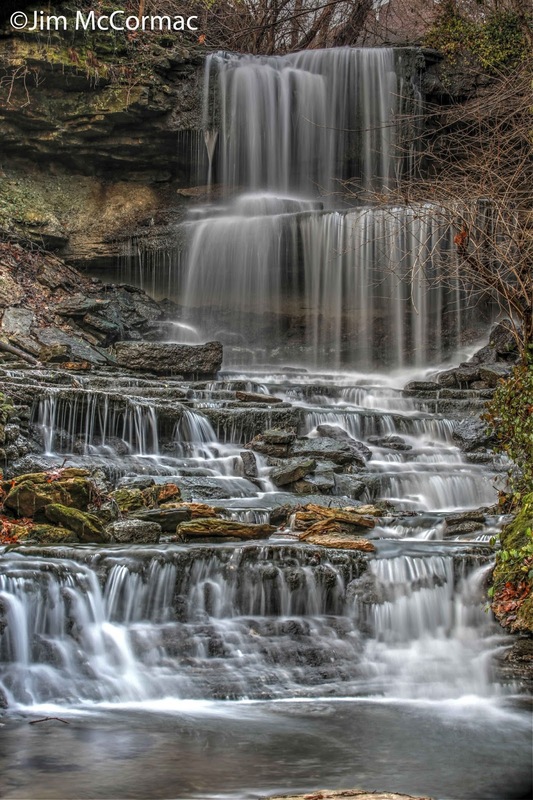 Ludlow Falls. 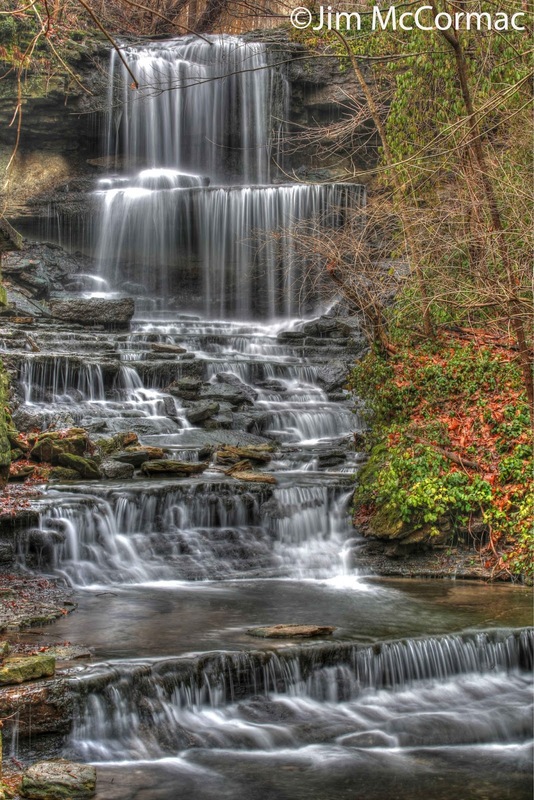 This one lacks the elaborate complexity of the West Milton Cascades, but (for Ohio) is a fairly large and powerful falls, and quite impressive. A visual handicap is the State Route 48 bridge, which was, quite stupidly I might add, built right over the top of the falls. Thus one must take pains to compose photographs so as to exclude the bridge. Greenville Falls. The land around this one is owned by the Miami County Park District. Streamside cliffs just down from the falls harbor many rare plant species, and there is a planted prairie in the field above the falls. This falls and the previous two are all within 10-15 minutes of each other. 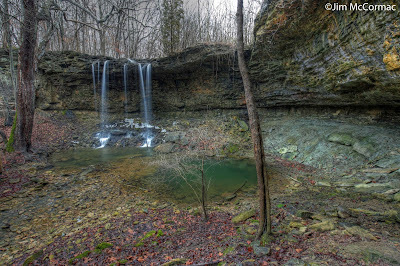 This is Charleston Falls, another Miami County Park District holding, and a site I had not visited before. It's pretty stunning; reminiscent of the Hocking Hills' Old Man's Cave, just smaller and made out of limestone instead of sandstone. This is the falls that I wish had had a bit more volume to the flow, but nonetheless the site was quite photogenic. Lastly, one more of the West Milton Cascades from a slightly different perspective. Ohio has plenty of awesome scenery if one just looks around a bit. 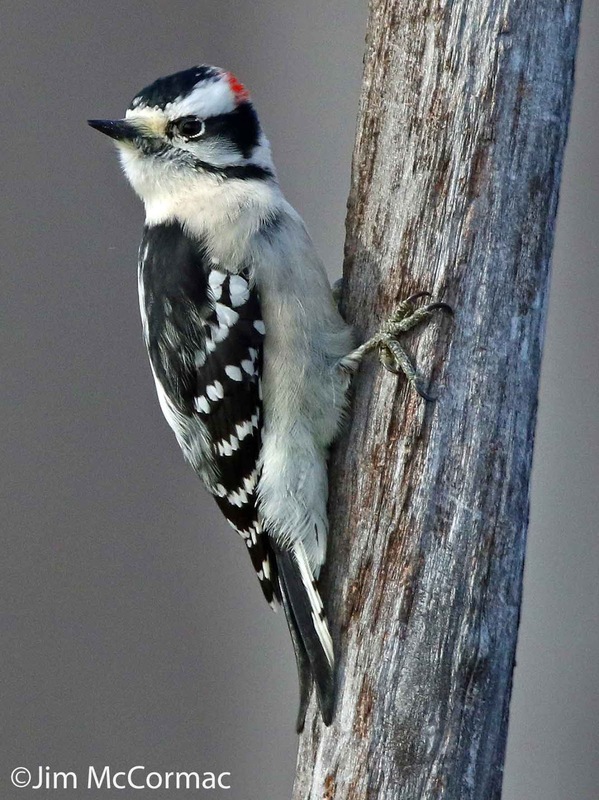 If you’re seeking a New Year’s resolution role model, consider the downy woodpecker. These traits are admirable in any organism. Having seen thousands of downy woodpeckers through the years, I will second Audubon’s effusive praise. The handsome little birds are almost always hard at work. There are just two lapses in the workaholic woodpeckers’ toiling: when they sleep at night; and when a bird-eating raptor rudely interrupts their routine. I made the accompanying photo just after a small falcon known as a merlin entered the area. The woodpecker skittered to the side of the trunk opposite the raptor and froze stiff until the predator departed. If one stumbled upon downy woodpeckers during their courting, one might think the birds are clownish. An amorous pair hops stiffly about, feathers rigidly ruffled, peeking at one another from behind limbs and making aggressive lunges. They might then engage in the “butterfly flight,” which must be seen to be believed. Usually tree-bound, the birds flutter through forest gaps, wings held high over their bodies and flapping with shallow delicate strokes. The gauzy flight display suggests aerial synchronized swimming. Courtship antics lead to mating and, ultimately, the production of little woodpeckers. Downy woodpeckers excavate a small nest cavity, typically in a dead snag well off the ground. The female lays up to eight eggs, which she incubates for about 12 days. Eighteen days after hatching, the young depart the nest. Old nestholes are used by many other cavity-dwellers, including chickadees, titmice and house wrens. The downy woodpecker’s range stretches throughout the United States and Canada, from the wildest Alaskan forests to urban Columbus. It is the most common and successful woodpecker in North America, with a population estimated at 14 million birds. Almost all who feed birds are familiar with the downy woodpecker. The industrious bird is quick to seize on an easy food source. It favors suet but will take seeds of all types. Most of the downy’s livelihood, however, comes from drilling into woody trunks and limbs for beetle larvae and other succulent entomological fare. A peculiar dietary quirk is a fondness for goldenrod gall fly larvae. The larvae are embedded in golf ball-like growths on goldenrod stems, and the woodpeckers expend considerable effort extracting the juicy grubs. Observers can be confused by a similar species, the hairy woodpecker. The hairy is larger and stouter than the downy — think Arnold Schwarzenegger versus Richard Simmons. It also has a much more massive bill and lacks black dots on the white outer tail feathers. Like the downy, the male hairy woodpecker has a crimson splotch on the back of the head. Tack some suet to a tree and welcome the hardest-working woodpecker in the grove into your yard. 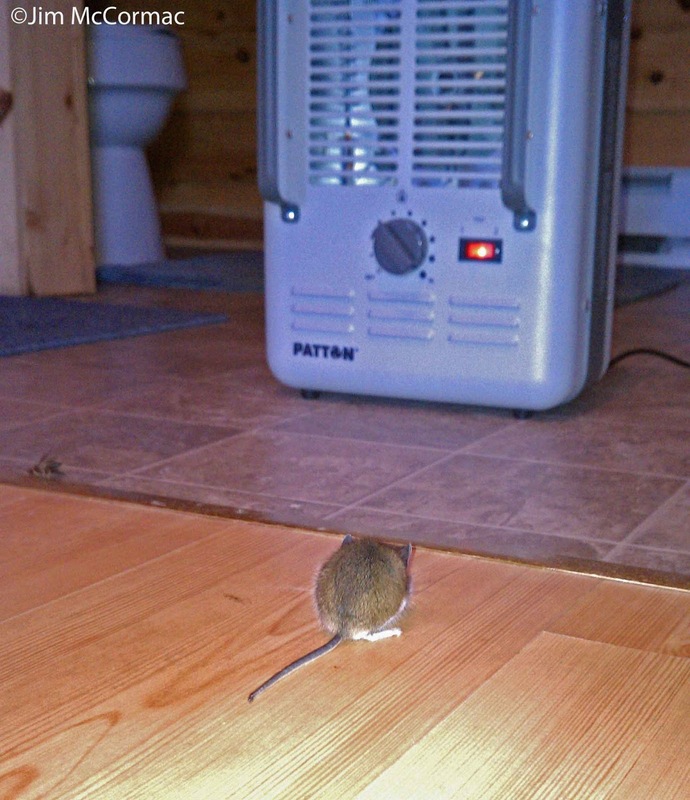 Today's icy temperatures reminded me of an interesting mouse experience. Almost five years ago to the day, I was at the Wilds getting the grand tour of their new Conservation Science Training Center (NOTE: The Ohio Ornithological Society will be hosting a grassland bird workshop here on June 24-25. We'll see birds galore - you'll not want to miss it). Jenise Bauman, Director of Conservation Science Training at the Wilds at the time, was my guide and after inspecting the main building, she pointed out the brand new cabins for visiting researchers' use. I asked to have a look inside one, and as soon as we popped the door open, I saw the little chap in the photo above. It turns out that they employed space heaters in the temporarily unused cabins to keep the interiors warm enough to prevent pipes from freezing. At the time, outdoors temps were well below freezing. The cabin interiors were probably in the 50's, and warmer than that right in front of the heater, where the mouse has parked itself. The mouse just took a glance back at us when we entered, and then promptly ignored its human visitors. The warm gush of air from the heater had thoroughly intoxicated the little beast. I was kicking myself for having left my good camera gear in the car (which was far away), and had to make due with my Android phone's camera and video. Ah well, it served the documentary purpose, but what I would have given to have had the really good gear to make really good photos. The rodent certainly was cooperative. This was the first time that I've seen a mouse warming itself in front of a space heater, and I may go some time before seeing such a scene again. By the way, this is a White-footed Mouse, Peromyscus leucopus, a native species and a truly handsome little mammal. For a really cute photo of one, and a bit more information, CLICK HERE. 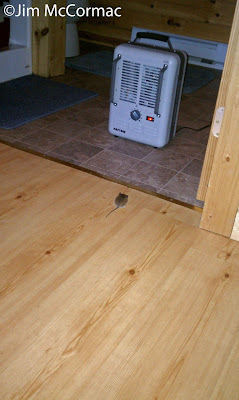 Here is a short video of the space heater-exploiting mouse. Today's dawn exposed heavy, leaden skies that threatened to erupt into heavy snowfalls. The temperatures, which ranged from the high 20's to low 30's F, were conducive to flurries, but other than a few flakes the white stuff was held at bay. 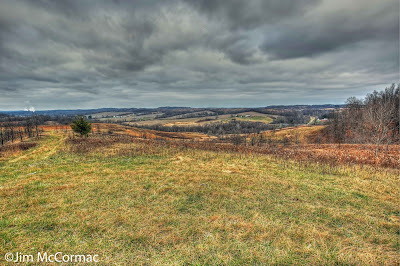 Gray winter skies do not make photography easy. I was really after birds, but the low light means high ISO's and wide open apertures, and often less than desirable images. So, I mostly just watched the birds, and there were many along the path today. I like the change of seasons that are so pronounced in the Midwest, and winter and its cold temperatures. But I find myself less enamored with all of the thick gray overcast skies that Old Man Winter carries along. A retreat to Arizona sometimes seems tempting at this time of year.